I’ve decided to do a series of posts on my little family, highlighting each member with a story or memory of their life. Today I’m going to tell you about my baby girl, Katy and then we will get to this delicious Brunswick Chicken Bake! I can’t tell you how many years I prayed for a daughter. And, oh my little sunshine girl! She was born with twinkles in her eyes and a face of peace and joy. 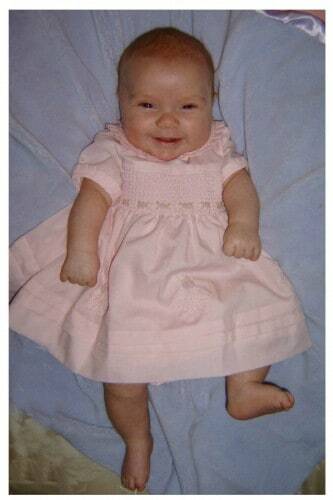 She was the best baby, spending most of her time smiling and just wanting to be held. We happily obliged, babies are for holding after all! We were those parents, too :). It was especially enjoyable for us because Brady had been my colicky baby and having been a first time parent then, but with a few years experience under my belt now, this just felt like a breeze. But there was one thing about my girl that served as a lesson to me early on, sort of God’s way of saying “She is your daughter but she is going to be her own person”, and that is what I am going to talk about today. You know that saying “A sweater is what child wears when its mother feels cold?” well that is certainly the case in our house. I am one of those people who could happily sleep beneath fifty quilts at night, while my husband is more of a single sheet or very lightweight blanket type guy. I thought THAT drove me crazy, until I discovered that Katy is more of a no-blanket-at-all type person! As soon as she was too old to swaddle, I’d put her in her crib, cover her up, and even in her sleep those legs would immediately shoot straight up into the air until they were free of the blanket, and then fall back down on top of it. No matter how many times I repeated the process of covering her up, the same thing would happen. I can’t tell you how many times I have covered that child up over the last ten (almost eleven) years but I can tell you that each time was fruitless. I’d lay in my bed at night, fretting over it, wondering if her feet were cold and convinced they were, only to get up and slip into her room, covering her up as gently as I could. Without fail, every single time, she’d be uncovered by the time I got to the door. This has been our dance for over a decade now. So last night, I went into her room and looked down on that happy little face, full of joy and peace even in her sleep, and smiled at seeing one of her legs still covered up. Almost as if on queue she flicked that leg out and pushed the covers off. And I was reminded that her life is not mine to live but just to be a part of. And I smiled at her stubbornness and how true she is to herself. Even in her sleep. So I kissed her forehead. Thanked God for my daughter. Today’s recipe is quick to put together and a one dish meal with the flavors of our favorite stew. To make this recipe, you’ll need: Frozen baby limas (unless you just hate limas, then use some other vegetable that you have a better relationship with), frozen gumbo vegetable mix (unless you just hate gumbo vegetable mix, then use some other vegetable mix that you have a better relationship with), frozen southern style hash browns (the cubed ones. If you hate hash browns, its time to start examining your issues with veggies at this point), Diced tomatoes, Italian Dressing mix, BBQ sauce, and some chicken. 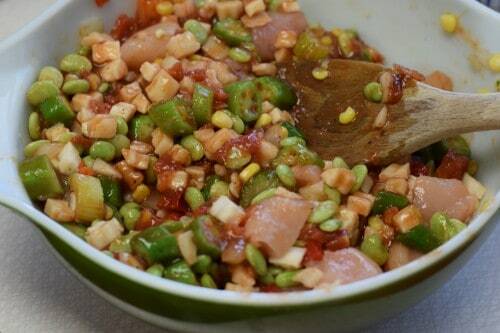 Take all of your ingredients and stir them together in a large bowl until well mixed. Now whenever I use frozen limas people are always surprised they don’t have to cook a lot longer but usually folks are thinking about dried beans and these are dried, they’re frozen, So think of them like you would other frozen veggies. Pour this into a 3 quart baking dish or 9×13 pan. Cover with foil. Bake at 350 for 45 – 60 minutes, or until chicken is done and vegetables are tender. Before serving, stir this again really well to evenly distribute the sauce. 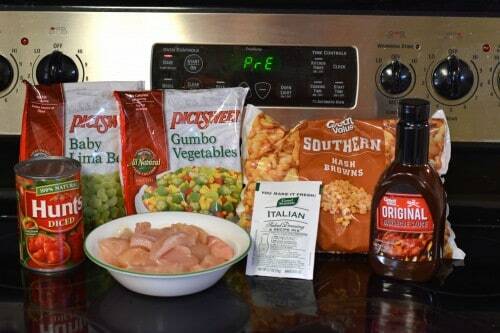 Place all ingredients in a large bowl and stir until very well mixed. Pour into a greased 3 quart casserole or 9x13 pan and cover with foil. Bake at 350 for 45-60 minutes or until veggies are tender and chicken is cooked through. Stir well before serving. I thought similar when my Daughter was born, she was perfect in every way, she even resembled me a lot, but she is her own person, it is very gratifying when you see they grow up into a great person, mine is now 48 (older than you) and I still marvel in the miracle all the time. Hope you have the same feeling in 30 years. Each day just holds such immeasurable blessings! You sure can! I would definitely go on the heavy side with the barbecue sauce in that case though (1 cup). High, 3-4 hours or low, 7-8.
my daughter is 42 now and definitely her own person, and also my best friend! Thank you for that lovely post. I have an 8 month old and I am eternally grateful for him. I loved hearing how much you love your little girl. I’m always so happy to hear stories of love. Such a precious child! I look forward to meeting the rest of your family. This recipe looks scrumptious and easy – thanks! Have a glorious day, Christy. This is my 3 year old. She won’t even let me have covers if I’m laying with her. And I’m like you I want 50 blankets on me. Hahaha, Christy, she hasn’t changed a bit in her face. I would have recognized her anywhere! How precious is that? The Lord didn’t give me a daughter, I have two sons. But guess what, I have FIVE granddaughters! I love all that girly stuff. She really hasn’t changed Carol. Oh my goodness how blessed you are!!! Isn’t it fun to buy pink?! What a sweet story about your little girl. I have 2 daughters (and 2 sons) and I know just how sweet a little girl is. There’s no such thing as too much cuddling! 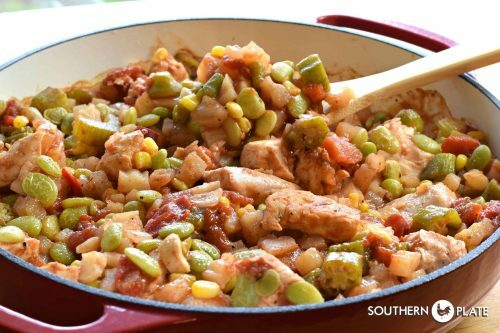 I love Brunswick Stew and the Brunswick Chicken Bake looks delicious! Definitely going ion my to-do list right now. Oh my goodness, I agree!! Never enough cuddling!! I hope you enjoy the Brunswick Chicken Bake! What vegetables are in “Frozen Gumbo Vegetable Mix”? We don’t have that in San Diego. Thank you for your thoughtful messages. I have never seen gumbo vegetables packaged in my area either but then again I have never known anyone to make gumbo here either. Hi Jennette, different brands will have different blends but the brand I chose included onion, red peppers, celery, corn and okra. I hope that helps. My daughter was the same way. When she was about 5 I asked her why she always kicks her covers off. She said “God skinned me with warm skin”. She is 39 now but I have never forgotten her answer. Oh my goodness, what a precious answer!!! I loved reading about Your beautiful daughter. Brought tears to my eyes. I never tire of reading about your beautiful family and the love and closeness shared. May God continue with His many blessings. Thank you Fran. I hope God blesses you abundantly as well!! Thank you so much Heidi, I am so glad you are enjoying the recipes!! Yes, I am already learning just how quickly time passes. It seems like all you have to do is blink. For us, this is four servings, with my husband eating two helpings 🙂 It really depends on how much you eat. A good rule of thumb is to consider how many a 9×13 casserole serves in your family since servings and serving sizes are so relative 🙂 Thank you so much Rita! Christy I’ve been trying for 19 years to keep my daughter covered and yet to succeed. Sometimes I think to myself, “Self she is glad to be in college 6 hours away because she can sleep how she wants without me covering her!” I have enjoyed every coo, giggles, mumbling, sounds, words, all shucks I even felt blessed to be able to hear her cries! I love that GIRL of mine! Great post today! LOL, I imagine Katy will be the same Marsha. Yes, we are so blessed to have our girls!! This is a terrific recipe! I fixed it tonight for my family and they loved it! I added a little extra okra because we can’t get enough of it. The 1/2 cup of bbq sauce was just right for us. Next time we’re thinking of adding some sliced kielbasa to it. Yum!!! I am so glad you liked it Jane!! The picture of Katy in the pink dress is precious. She looks the same. Great smile as a baby too. I enjoyed your message. Oops, somehow I hit ‘send’ before I finished my story- please forgive the typos. Anyway, after many years of praying for a child and fertility treatments, my husband and I were blessed with our daughter, Erin. She was such a precious answer to prayer (and still is, 14 years later!). When she was 2 weeks old, she started with colic that would last for 6 months. She slept in her swing until she was 6 months old, for that was the only relief she could get from colic. I laughed when I read your story about Katy kicking her blankets off, because Erin did the exact same thing. Exactly how you described it, is exactly how she did it. We would laugh as we watched her pull her legs up in a perfect 90-degree angle and kick those blankets off. 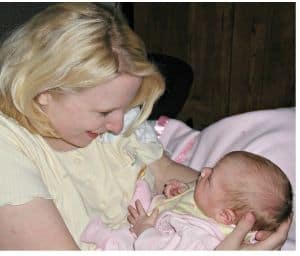 It took me a few years before it finally hit me: I wondered if all those times I kept putting those blankets on her, if I was aggravating her colic? I guess I’ll never know, but it was a fun trip down memory lane, reading your story about Katy and her blankets. And, 14 years later, Erin still kicks her blankets off, too! As always, love your stories and your yummy recipes. Thank you for sharing -such a blessing! Thank you for sharing a wonderful story and recipe. I am so thankful you are in my life. Thank you Bonita, I am blessed to have you in mine as well!! My beautiful daughter is 37 and she has grown up to be my “dream catcher “. She gets a dream her mind and she makes it happen. Like a couple years ago when she & my 3 grandchildren moved from Virginia to Idaho. We are here visiting now, and it is really a awesome state. So different from Virginia but i can understand why she calls idaho home now. That’s my independent girl. Love your recipes…this sound like a plan for dinner after sightseeing today! 🙂 I hope you enjoy your visit Virginia!!! Thank you Jeanette, we have truly been blessed by her!!! I’m a new mom and fret over the same “cover issues.” Thanks for sharing! Your revelation brought tears to my eyes and joy to my soul! Thanks for the delicious recipes and precious stories! I love your stories, Christy! So personal and sweet. And this chicken looks fantastic! HAHA! I’m the mother of a son that not only refused to wear coats when the weather was freezing, but wanted to wear shorts year round. By the time he was 8 or 9, I figured I’d stop wasting my money on big winter coats and that he was old enough by now to know whether or not he was cold and he’d let me know! Well, he’s 19 now and still as hot natured as ever. 🙂 It drives you crazy doesn’t it, but they know themselves. I made the Chicken Brunswick stew over the weekend and I have to say, it was pretty darn good. It was so easy to throw together. My store didn’t have much as far as mixed vegetables, so I used a package of cauliflower & broccoli. The sweetness of the barbecue sauce really added to it. Thanks so much for all your wonderful recipes. I am so glad to hear that you liked it Beverly. I have to say, I have never made it with broccoli and cauliflower but love that you were innovative and made it work!! I’m sure this meal is good, but this story is GREAT! Great lesson here, thanks. Thank you so much Becky, you just made my day!! !